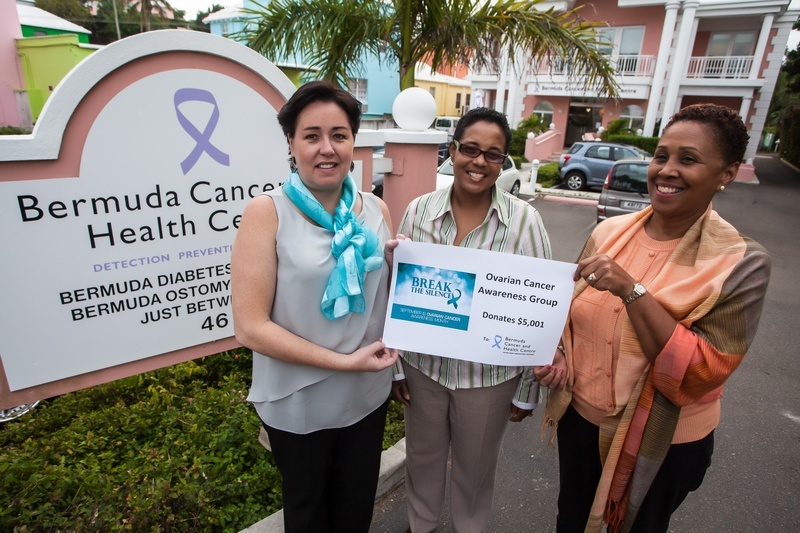 On November 27, 2013 the Ovarian Cancer Awareness Group presented the Bermuda Cancer and Health Centre a check in the amount of $5,000 from their fundraising efforts during the month of September. The group only had 10 days to plan the month of events but was able to harness enough support to hold a number of events including the gala luncheon to end the month of events. BCHC will be responsible for distributing the funds to support women that need financial assistance. This photo appeared in the December 6. 2013 Royal Gazette newspaper. The luncheon was an overwhelming success. Everyone buzzing about how enjoyable the afternoon was with great company, good food, entertainment and information. A great combination to end a month long campaign, hoping to save a life. Thank you to our speaker Tara E Soares for her word of encouragement and to young Mr. Aaron Spencer III for his lovely musical selections. 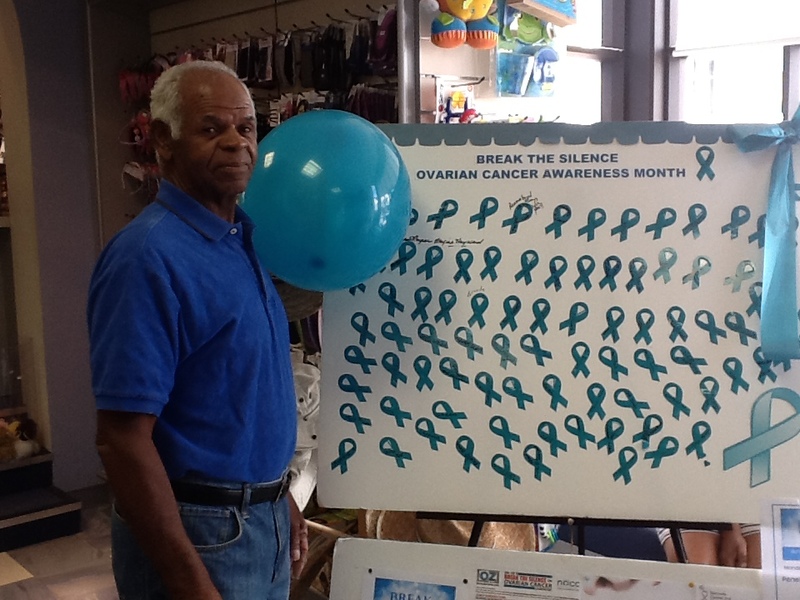 Big thank you to everyone who helped to make the Ovarian Cancer Awareness month a wonderful success. Another good day with the recognition board at the Hamilton Market Place. 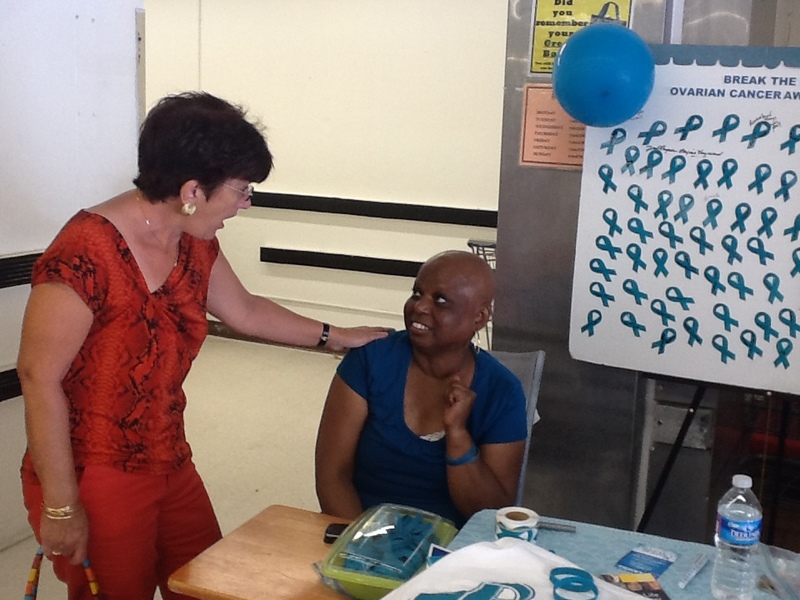 There was a lot of interest and many people had never heard of Ovarian cancer. Those who had said they did not know that it was very hard to detect. We also sold tee shirts, braceletts, pins, scarves etc.it was a great success. One day we hope that funds raised are able to assist the Bermuda Cancer & Health Centre offer a Proactive Energy Program the purpose of this program is to help patients battle the side effects of cancer treatments, particularly loss of energy, through emotional support, physical activity and nutrition counseling. Patients would be referred into the program by their gynecologist. Further to that we hope to start a "Look Good, Feel Better" nonmedical, brand-neutral public service program that teaches beauty techniques to cancer patients to manage their appearance. 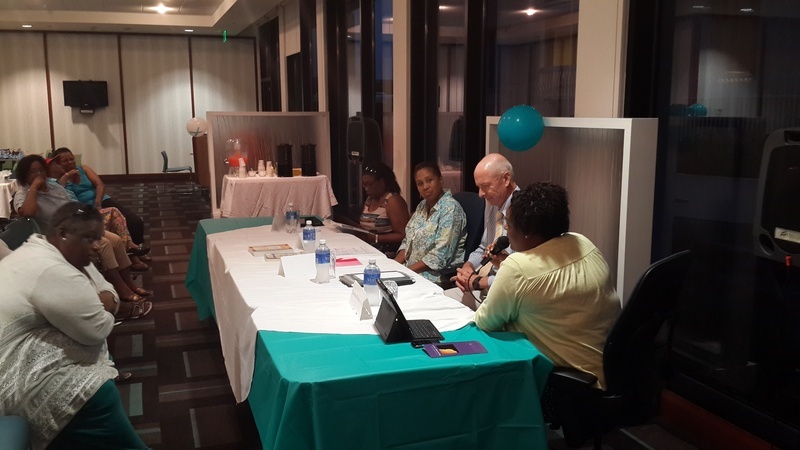 Last Monday, September 23rd we had a good turnout for the Panel Discussion on Ovarian cancer. There were lots of question, and some surprising answers, but most of all in was very informative. Everyone who attended this event was ready to share what they had learned with others. Thanks to our panelist for taking time from their busy schedules to share their knowledge and to AIG for their support and allowing us to use their facilities to hold this important event. Thank you Mr. Furbert for assisting with manning the recognition board at Robertson's Drug Store on Saturday, September 14th. The Recongnition Board was a big hit.at Shelly Bay Market Place. There was lots of activity and the board is almost filled with the paper ribbons representing women who have been diagnoised with Ovarian cancer or who have passed with it. Lots of information was handed out and people were very grateful. Thank you to Janet Richardson, Gloria Dill, Denise Richardson, Llewellyn Furbert and others. The board was located at Lindo's in Devonshire on Saturday, September 14th. There was lots of support for the event, with people talking about their experience with Ovarian cancer or their loved one's experience with the disease. One person talked about their mother who is a 30 years survivor. Thanks to the following people who volunteered to man the board: Jackie Bremer, Melissa Logie, Tanika Carter, Beverly Russell, Eliott Darrell and Eleanor Stovell. They handed out over 75 information sheets to people about the symptoms of detecting Ovarian cancer.